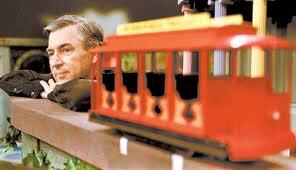 Mr. Rogers was a daily part of our morning when my daughters were little girls. As an ‘older’ mom, I often heard from younger moms with children my girls’ age that he was out of date and old fashioned. In a world of Rugrats and fiesty self-oriented cartoon characters, Mr Rogers represented a tone and message I felt was missing in much of children’s programming. 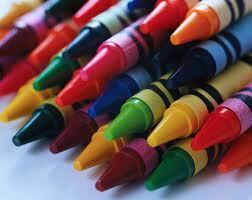 Truth be told, I loved his field trips, learned how crayons are made and other assorted lessons right along with them. I recently read an article which reminded me that no matter what happens in life, ‘simple and deep’ is probably what drew me to Mr. Rogers as well as to the most important people in my life. I was also reminded that sometimes in darkness and pain we move away from the light rather than toward it’s offer of comfort and care. I realized that in the last couple of years, in many ways, I allowed a void to take the place of things that used to bring me comfort; including places I used to visit regularly, music I used to love, and memories that made me smile. “Light’ for me represents faith and belief in whichever way it is described. Whether it is referred to in terms of God, Christ, Jesus, Buddah, Hope, Heaven, The Other Side, Connection, Love, Eternity……I have become less concerned with the ‘labels’ in the last two years, and much more aware of the ‘greater’ concept. 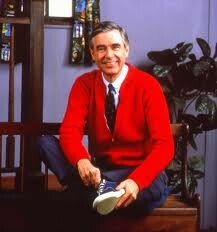 The following, written by Lex Breckinridge, reminded me why Mr. Rogers was a part of my daughters’ lives. He offered light in a simple way. “Deep and simple is far more essential than shallow and complex.” This off-the-cuff observation was made by Fred Rogers, better known as “Mr. Rogers,” creator of “Mr. 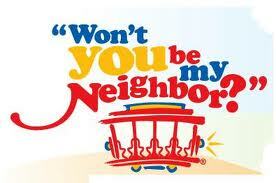 Rogers’ Neighborhood,” the longest running series on PBS. He said it to a young man named Benjamin Wagner during a conversation about Wagner’s job as a journalist and a producer for MTV, a job that Wagner regarded with much ambivalence. Rogers turned to him and said, “You know, Benjamin, I feel so strongly that deep and simple is far more essential than shallow and complex.” Mr. Rogers died not long thereafter, and Benjamin, who said that this comment haunted him for years, set out on a journey of discovery to get to know the real Mr. Rogers, to seek out the neighbors who knew Mr. Rogers best, to see what that seemingly offhand comment might really mean. In the documentary we see the late Tim Russert saying that Rogers was “… forever taking advantage of every moment to tell people that it is important that we respect one another and love one another.” Linda Ellerbe observes that Rogers believed that everyone “… had this wonderful person inside who was just dying to get out, and he was going to open the door for you, and then help you open the door for others. That’s pretty simple and pretty deep.” A life’s work spent affirming the goodness of individual human beings, honoring their dignity, and teaching and encouraging them to pass that respect and love along to others. That sounds positively counter cultural. It certainly goes against the grain of our noisy, hypercompetitive world. In fact, it sounds like the gospel, and it sounds like Jesus’ instructions to his disciples to go spread the good news. Deep and simple, indeed. We work diligently to make our lives complex. Do you feel as if your life is overscheduled? If so, chances are it is overly complex. Yet, all this complexity gets in the way of true human encounters. Anything and everything we do that does not affirm the worth of another human being or that ignores or overlooks another person who is as much God’s Beloved as we are probably indicates a degree of complexity in our lives that is life-denying rather than life-affirming. See Nobody Gets Off Scott Free for a full list of articles and resources for bereaved parents and/or those experiencing loss. When The Angel Of Death Comes For Your Child : A description of this loss as a ‘bomb site’. First responders arrive to help. Our Spirit Functions At A Higher Level : Does the spirit function at a level that we are not aware of? The Tenderhearted Friend A description of the type of friend every bereaved parent would be thankful for. External Beings Experiencing An Earthly Life Are we merely flesh and bones with no spirit or soul? If we have a soul, then what does that mean? After The First Year Things to expect after the first year anniversary of your child’s death. Many are not prepared for it. Quit Expecting Me To Get Over This : A discussion of the road travelled by bereaved parents and the ease in which they can fall into a perpetual dark place. Video of Dr. Pilstick as he explains his view of this type of loss. Video Of A Mother’s Journey Of Grief: 2 videos. 1)Cynthia Seefahrt talks about her journey after her son died in a mountain climbing accident. 2) A clip from the documentary ‘Space Between Breaths’, interviewing parents who are trying to find their way after losing a child. Our Children Are Not Lost : Word choices. Sensitivity to the word ‘lost’. Where are our children?Watching My Parents A window into the heart of a sibling who grieved the death of her brother and gives thanks for the way her parents went through the loss. Her fear that things could never be the same again. External Beings Experiencing An Earthly Life Are we merely flesh and bones with no spirit or soul? If we have a soul, then what does that mean?Attitude Matters Do our minds influence our physical world? Does the energy of our soul communicate through vibration? THAT’S Something To Think About Are we evolving in a spiritual way that would make Darwin roll over in his grave? Soul Searching Have we had a hand in choosing our journey before we were born into this world? Did we agree to this heartbreaking experience? Thought provoking. Sorrow And Expected Recovery Sorrow strips away the bumpers of life that ricochet us away from serious introspection. Is it transformational? Who Understands This Pain? In the midst of tragedy, shock often renders us senseless. Conversations In Memoriam: The Elephant In The Room :One of the hardest things for bereaved parents; being surrounded by family or friends and nobody will talk about the deceased child, share memories, or even mention the name. Bill Cosby and Pat Scheibert Write About Loss Summary of two books. What Never To Do When Someone You Love Loses A Child : Dr. Barker lists 9 things to avoid when you a trying to help someone who has lost a child. 5 Stages of Grief Elisabeth Kubler-Ross is a pioneer in near death studies. She spent her life contributing to hospice care and has written extensively about grief. Choking On Reality The see-saw effect of trying to find hope vs. the grip of grief. The Day the Music Died Insights about the simple joys that are lost when a child dies. Words of comfort by a best selling author who discusses what has happened and how to face the challenges of the future. Joy? What Joy? My Three Letter Word is….WHY? Is is possible to find joy after the death of a child? Kathleen O’Hara writes about that 3-letter word in her book, A Grief Like No Other. Why Me? Thoughts in response to the questions that will never have a satisfactory answer. A Mother’s Connection Selected remarks made by Sandy Wiltshire at the conclusion of her book, My Gift of Light. Her journey and search for meaning, after the loss of her daughter, was not only unique but interesting. An eye opener. How To Talk To A Bereaved Parent In her book, Parental Loss of a Child, author Theresa Rando discusses that we are living in a death-denying society. The Test. Can We Pass It? J.R. Macduff goes right to the center of suffering in this short piece about ‘the test’. I Dream Of Jeannie’s Nightmare : Barbara Eden, star of the sit-com rerun favorite I Dream Of Jeannie is interviewed about her son’s death. Also included is an interview with Donny Osmond talking about is sister Marie in the aftermath of her son’s suicide. Discusses the choices that arise as we begin to face the future without our child.